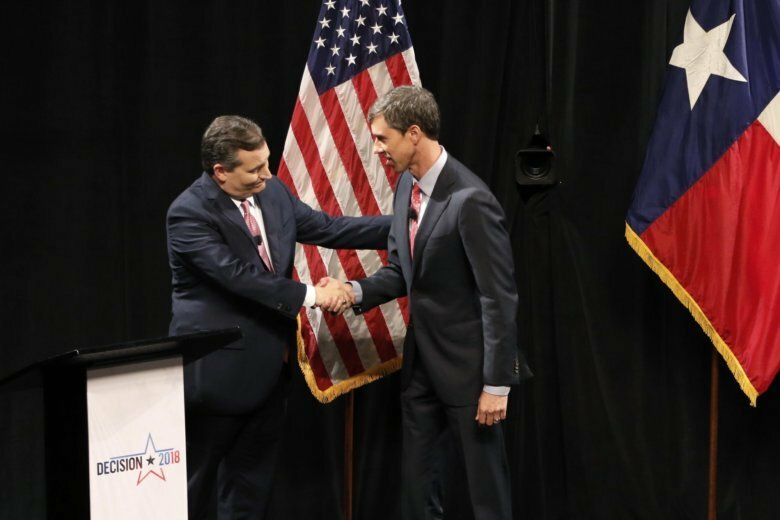 DALLAS (AP) — Republican Ted Cruz and Democrat Beto O’Rourke repeatedly traded barbs during a testy first debate Friday night, underscoring how a Texas Senate race that long looked like a cakewalk for the conservative incumbent now appears to be anything but one. Cruz went on the attack moments after stepping on the stage, charging that his opponent suggested that police officers embodied “modern-day Jim Crow” laws in response to a question about a Dallas policewoman who shot and killed her unarmed, black neighbor after saying she mistakenly entered his apartment, thinking it was her own. The case is still under investigation. Later, when Cruz tried to say O’Rourke wanted to abolish the Second Amendment, the Democrat said it wasn’t so, and the candidates sniped while the moderators pleaded for them to stop and for the audience to stop hooting. O’Rourke said Texas was ready for a senator who will protect the Second Amendment while imposing small restrictions to save lives and prevent mass shootings. He suggested those were supported by “gunowners and non-gunowners alike,” but when he said the common GOP refrain after gun violence of offering “thoughts and prayers” wasn’t enough, Cruz bristled. Democrats have long dreamed of flipping heavily Hispanic Texas, the country’s largest red state, and transforming the national electoral map. O’Rourke is giving up his El Paso-based U.S. House seat to try and upset Cruz, even though his party hasn’t won any of Texas’ two dozen-plus statewide office races since 1994, America’s longest political losing streak. O’Rourke, however, has repeatedly insisted he has no political plans beyond this race. He’s visited all 254 Texas counties, including areas that Democrats long ago gave up on — a fact he mentioned repeatedly during the debate. Cruz dismissed many such visits as photo-ops. A truck mounted with a portable billboard of a February 2016 Trump tweet declaring, “Why would the people of Texas support Ted Cruz when he has accomplished nothing for them?” was parked near Friday’s debate site. It’s frequently hit Texas political events since Trump announced plans to visit. Asked Friday about Trump’s 2016 criticism, which included making fun of Cruz’s wife’s appearance and suggesting that his Cuban-born father had a hand in the assassination of John F. Kennedy, Cruz said, “I could have chosen to make it about myself,” but instead he said he worked with Trump to further Texas interests. That ignored Cruz drawing the ire of many Texas conservatives for refusing to endorse Trump during the 2016 Republican National Convention. He eventually supported his party’s candidate, though. O’Rourke criticized Cruz during the debate for failing to rebuke Trump administration tariffs against China, which he said would hurt Texas trade interests. Things are likely to stay nasty in coming weeks.